*WITH HUGE APOLOGIES TO ONE OF MY FAVORITE PUBLISHERS! Tom Newkirk used to talk about the Heinemann classroom. You know, one of those classrooms where all of the students gaze in rapt attention as the teacher delivers a flawless minilesson (and no one picks the gravel out of the bottom of their tennis shoes or has flatulence issues). And then those same students leave the meeting area, open their beautifully decorated writers' notebooks (no one's notebook ever disappears or has pages glued together), pick up their previously sharpened pencils (which never break within the first 30 seconds of quiet writing time) and write masterly, carefully crafted pieces, which they then share with well-trained conference partners who deliver brilliant advice which leads to still more wonderful published pieces. I have a confession to make. I am so NOT the Heinemann teacher. I so DO NOT have a Heinemann classroom. Take last Wednesday, for instance. I am in a second/third grade grade ELA-E/ELA-S classroom (a room where students whose first language is Spanish speaking are transitioning into English). My state says that if ELL kids have been enrolled in schools in the United States for three or more years, they have to receive most of their instruction in English and they have to take the state reading and writing tests in English. And so now, a week before the writing test, we are doing our best to prepare them. Today's prompt, "Everyone has things they like to do. Describe one of your favorite activities and tell why it is your favorite." I believe kids need to talk before they write, so we spend time talking about our favorite activities-- I tell the kids I love walking my dogs in the park. We talk about sports- baseball, soccer, football and basketball. We talk about games (mostly video) and craft activities. We talk about things kids do with their families- swimming, camping, picnics. After a few minutes of conversation, I think we are almost ready to write. I draw a large four square planner on chart paper, model my thinking, then send the eight and nine-year-olds off to plan and write. Sounds pretty Heinemann-ish so far, right? Actually, midway through the mini-lesson, X started to get very teary and now he is in full scale crying mode. I sit down next to him on the rug and ask what's wrong. Sick? Worried? Someone hurt his feelings? X cries harder. "I just want to go home," he wails. "I just want to go to bed." X lays down on the rug, curls up in something akin to the fetal position, pulls his hoodie over his head, and continues to weep softly. I am not quite clear on what is wrong, and I don't know how to fix it, so I sit next to him and rub his back. In the meantime, E announces that he has lost his notebook, and several students engage in a mad search (there really are classrooms where someone's writer's notebook doesn't get lost every day?). Eventually the lost notebook is found under E's chair and most of the other kids settle in and begin to write. A small crowd of X's friends, though, are concerned that X is unhappy and they bring their notebooks to the rug and formed a kind of circle around X. Usually I'm pretty strict about the first 2o minutes of writing being at your seat, but today, I let it go. R, one of my friends from a second grade intervention group, is X's good friend, and sits right beside him. R wants to write about playing baseball. He is on a team, he tells me. "What's the name of that team?" he asks me. "You know," he says, "the ones with the red and white shirts. They start with kuh." I actually don't know much about the baseball teams in the area, although I might be able to play "Name That Team" if we were talking about football. X raises his head slightly. "It's the Cavaliers," he says. "We play on the Cavaliers." L, another second grade friend, appears at my left shoulder. "I want to write about explosions," he declares. "You know, the ones where the red and blue stuff bubbles. They do it in Mr. M's class," he says, pointing toward the fifth grade room next door. I don't know much about the red and blue explosions in Mr. M's class either. "You mean the science experiments," I say. L is a little irritated with me. "You know," he says. "Like this…" He begins to sketch. First he draws something that looks like a beaker. "Science experiments?" I repeat. "You mean you like to do science experiments." "No," says L. "Like this." He uses his eraser to scrub out the beaker-ish thing, then draws what looks like a test tube and someone in a lab coat. "You mean you like science club?" I ask. L does not look totally convinced, but evidently decides that that is as good as it's going to get. He scrubs out the picture of the scientist-looking person and goes back to his seat. R is still writing about baseball. "And I did it four times," he says proudly. "You hit the ball four times?" I ask. "No," says R. "I catched it." "You caught the ball four times?" "Yeah, I catched it," says R. X pokes his head up again. "Does that say favorite?" he says, pointing to a word on R's paper where the spelling is a little questionable. L, still trying to figure out his plan for science experiments as his favorite activity, is back at my shoulder. "What else can I say?" he says. I try to remember what science experiments they have done this year. "Butterflies?" I say. "Did you like watching the butterflies grow? Or how about dissecting the pigs' eyes in science club?" I turn back to R, who is trying to help his friend G with English spelling. "You know," he says, "an e, one of these." He forms an i in the air in between them. E is the name of the letter i in Spanish, and the information appears to be helpful to G. I try not to think about every grad school class I have ever taken- children are supposed to work in one language or the other-- they are not supposed to code switch. "Do you know how to spell brother?" G asks me. L comes back again. "Do you know about Michael Jackson?" he asks. Michael Jackson??? What happened to the explosions with the red and blue water and learning about eagles? I glance over at his paper and see that he has totally changed his plan and is now writing about Michael Jackson. "Do you know about Michael Jackson's dances?" he asks. "A little. I know the moonwalk." Evidently, so does A, because he jumps up from where he has been sitting next to X and proceeds to demonstrate. "No that's not the one I mean," says L. He stands on one foot and uses the other to make a scissor motion across his shin, in a move that looks vaguely like someone trying to itch a mosquito bite on a hot summer evening. Much to L's annoyance, I don't know the name of that dance either. "You could say you like to do his dance steps," I suggest. L gives up on me and goes away. "So do you know how to spell brother?" G asks again. Mrs. S. catches my eye. "Carol, we have to end. I have a bunch of stuff to pass out today." I look up at the clock and it's 3:30. The kids leave in ten minutes so share time will have to wait until tomorrow. Someday, I will teach a high school history class. I won't teach it using the boring, tedious, fact-packed history text that my sons are forced to plow through. Instead, I will teach history using children's literature. 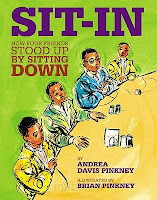 And when I do, Andrea and Brian Pinkney's newest book, SIT-IN: HOW FOUR FRIENDS STOOD UP BY SITTING DOWN, will definitely be at the center of our unit on the Civil Rights Movement. On February 1, 1960, four college students- David Leinall Richmond, Joseph Alfred McNeil, Franklin Eugene McCain, and Ezell A. Blair, Jr. took their seats at the Woolworth's lunch counter in Greensboro, Tennessee. They didn't need menus. Their order was simple. A doughnut and coffee, with cream on the side. Woolworth's was busy so the friends waited. Patiently. Silently. Without a fuss. They were the only black kids at the counter. They didn't get served that day, or the next, or the day after that. But each day, more students showed up, and soon there were lunch counter protests in Virginia, Tennessee, Alabama, Georgia, and many other southern states. Life was not easy at the lunch counter- the sitters had coffee poured down their backs, milkshakes flung in their faces, and pepper thrown in their eyes. Even so, they perservered, and on July 2, 1964, Lyndon Johnson signed the Civil Rights Act of 1964 into law. The book is beautifully designed. Andrea Davis Pinkney somehow manages to weave a cooking/recipe metaphor throughout the book, with words that are so carefully chosen, they almost pass for a poem. Short quotes by Martin Luther King, Jr., done in bold and colorful block letters, are interspersed throughout the text. The back of the book includes a timeline of the Civil Rights movement, as well as a more detailed account of the lunch counter sit-ins. A must have for anyone who wants kids to understand this very important event in Civil Rights history! This has been a hard, hard week. Our third graders took the state reading test, and it was, as always, very, very tough. Because I an interventionist, I usually test a small group of kids who are not yet very far down the reading road. This year, I tested two kids who have immigrated from Africa in the last eighteen months, a little gal from Mexico, and two little guys who just struggle. And even though I know in my head that this test is one measure of these kids, on one day, and even though we have lots of other data about these kids as readers, and even though I know the test is incredibly culturally biased (I wish I was allowed to write a post about that), and even though I know there is an almost perfect correlation between test scores and the price of real estate in any given neighborhood, the test always leaves me feeling really, really tired, and really, really, really discouraged about my abilities as a teacher. On those weeks, I just gotta find stuff that makes me laugh and makes kids laugh (and hopefully remember that they really are readers). 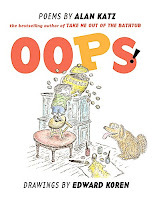 Alan Katz' poetry has been making me do that for a long time, ever since I discovered TAKE ME OUT TO THE BATHTUB, a book of silly poem/songs (one of about ten silly dilly songbooks, I think). Last week, at CCIRA, I picked up one of his newest books, OOPS. All week long, I have been hauling this book from class to class, giggling over its silliness. Kids keep begging to borrow it, and I can tell I'm gonna need to buy another copy really soon. Katz writes poems about stuff kids know- sharpening pencils, dirty hands, annoying parents, and going to the dentist. He's perfect when you just need a good laugh. to go out and playn't. Maybe that's why I could identify with the narrator of SNOW DAY. 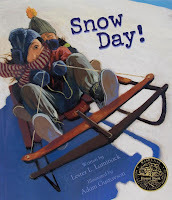 In this book, the weatherman is predicting a big storm, and the narrator imagines all of the fun things he will do with his day off from school- build a snow fort, sled on the neighbor's hill, drink hot chocolate. The next morning, though, when the family wakes up they discover that there is not a snow day, and they have to rush around crazily trying to make it to school in time. There's even one more twist, but I'll let you discover that for yourself. A fun book to read when there's a snow day. Also a great mentor text for description or point of view! Summer is just around the corner. The boys want to go to at least three football camps each. There will be combines. They will need new cleats and gloves and ankle braces. Everything costs lots of money. So I tried to exercise restraint at CCIRA. But I had to pick up at least a couple of new books to bring back to my kids. The illustrations,done by three different illustrators with three really different styles, are the funnest part of this book. Kevin O'Malley, the author/illustrator, tells his story with the three main characters, talking in comic-like conversation bubbles. Carol Heyer tells the story of Princess Tenderheart, with classic fairy tale illustrations similar to those of KING BIDGOOD'S IN THE BATHTUB. 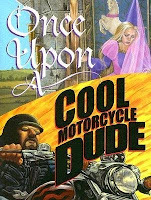 When the Cool Motorcycle Dude roars onto the scene, then Scott Goto takes over. Spring, 1980. I am a junior at the University of Colorado and take a reading methods class from Dr. Donald Carline. Carline is a past president of CCIRA (Colorado Chapter of the International Reading Association) and insists that all of us attend that association's annual conference. I don't remember attending any sessions that year, mostly I think I just wandered the exhibit hall and begged free samples from anyone who would give them. Linda Hoyt- Linda did an hour-long session on interactive literacy. As a presenter, I was fascinated by the way she used/didn't use powerpoint. Linda's entire presentation was done almost entirely in photographs and images and video clips. Powerful stuff. She shared brain research about how kids can't listen for more than seven minutes without DOING something, but she didn't just share the research, she crafted her whole presentation so that we, the session participants, didn't have to listen for more than seven minutes at a time. Such a great example for teachers and presenters. Linda's research spoke especially loudly to me, not only as a professional, but also as a mom. I've been struck recently by emails I've recieved from teachers about my sons' alleged issues in their classes. So many of these seem to really speak to teaching deficiencies, e.g. when a teacher says to me, "Your son just can't sit still and take notes for 45 minutes," it takes everything I have to not just snap back, "No, my son can't sit for 45 minutes. And even those kids that can, shouldn't have to." Patrick Allen- Patrick's a brilliant Colorado teacher and I've followed his work with the PEBC for years. Most recently, I've enjoyed reading his blog, All-en-a day's-work.blogspot.com (His recent entry, "Is it a problem?" about buying books had me laughing so hard I was crying!) . He presented a session on conferring, using material from his newest book, CONFERRING: THE KEYSTONE OF READER'S WORKSHOP. Patrick is a master at talking and listening to kids and I loved learning from him. Especially enjoyed his five "ashlars" (an ashlar, as I understand it, is the stuff that holds a stone masons' work together). Patrick's five ashlars are 1) defining the trust, respect, and tone of the workshop 2) strengthening readers' strength and endurance, 3) discussing purposes and audiences 4) focusing on gradual release and responsibility and 5) focusing on the structure of the reading workshop. I also loved Patrick's format for conferring and can't wait to get to school tomorrow to mess around with it a little bit. Ralph Fletcher- Ralph shared information from his newest professional book book, PYROTECHNICS ON THE PAGE: PLAYFUL CRAFT THAT SPARKS WRITING. The book, which will be published in April, focuses on teaching children to delight and play with language. Ralph made one comment that really stuck with me. He said something like, "When we talk about words with kids, we are always so serious. We use phrases like word work and word study. We very rarely talk about teaching children to delight and enjoy and play with language." Fletcher went on to share some great examples, e.g. poetry from J. Patrick Lewis. I've been thinking, ever since, even this week, on the eve of CSAP, about how I can build more playfulness into my work with kids' writing. Friday. Poetry Friday. The fifth grade teachers want me to continue thinking with the kids about the purposes for poetry. They want me to talk about poems that tell a story or poems that teach a life lesson. I plan to use BASEBALL, SNAKES, AND SUMMER SQUASH, Don Graves' oldie but goodie. I can't find my copy so I head to our school library. 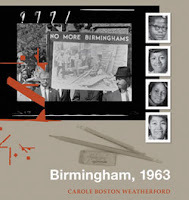 I don't find that book, but I find BIRMINGHAM, 1963, Carole Boston Weatherford's beautiful photo essay/poem about the Birmingham church bombing. The kids are Friday afternoon restless when I walk in, and a little apathetic as I remind them of the model we started discussing the week before, but quickly settle into the book. They become quieter and quieter as I read. When I am done, they have lots of questions. That really happened? Did they catch the guys who did it? Why would someone do that? Why would they do that in a church? Could that happen now? The conversation is rich and thoughtful and goes much longer than I had intended. I think of Louise Rosenblatt's notion that people need to respond to a text at the emotional/feeling/message level before they can critique the author's craft, and let them go. When the conversation wanes, I return to the topic of poet's purpose. I ask the fifth graders where they think this poem fits into the model. Many of the children think the poem tells a story and/or teaches a life lesson but Gregory has a different idea. He points to an empty box on the chart I have created. "I think you need a new category, Ms. W. I think you need to put "Reflecting on a historical event" here in this box." I am surprised, a little, I think, that this ten-year-old is ready to revise my most recent maybe brilliant thinking. A ten-year-old is making suggestions to the model of a fifty-year-old, veteran educator. I have a Ph.D., for pete's sake! As I think about it, though, I am more than a little pleased. If we truly are a community learners, and I really do want us to be, then every member of the community has the right to contribute and build and help other members revise their thinking. Consider it done, Gregory. Consider it done.